Sal is the liveliest and most developed of the Cape Verde islands. More than half of the tourists in Cape Verde make the trip to Sal to enjoy the crystal waters lapping long stretches of white, sandy beach, including watersports enthusiasts and holidaymakers who make the most of the rapidly developing hotels and resorts. The town of Santa Maria is home to the most popular resorts in Cape Verde. A former fishing village, the streets are lined with pastel-painted buildings that are more likely to host a souvenir shop, bar, or restaurant than anything else. Santa Maria has some of the best beaches in Cape Verde, stretching for five miles (8km) and popular for windsurfing, fishing, and scuba diving. Although Santa Maria is the most popular town in Sal, there are others worth visiting. Near the international airport is Espargos, where shops, bars and restaurants do good business and live music fills the air. The island's main port, Palmeira, is a working fishing harbour and import station, and is busily improving its tourist infrastructure as demand increases. Sal's landscape is unexciting, being flat and arid, but there are some interesting natural features nonetheless, including the salt lakes inside the extinct volcano crater at Pedra de Lume. Sal is also home to Cape Verde's best golf resorts. 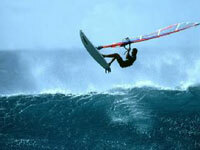 Tourists often enjoy day trips to the nearby island of Boavista, known for its sand dunes, by catamaran.